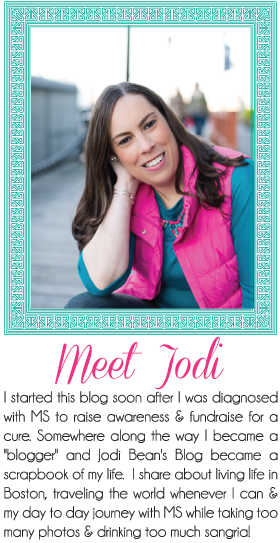 Jodi Bean's Blog: Merry Christmas To You From Me! Unfortunately I don't have access to a scanner right now so iPhone pictures of my Christmas card will have to do. I LOVE receiving Christmas cards (well honestly I mostly like getting the ones that include photos)! So I figure I need to send them to receive them. Even though I don't have cute kids or a dog to show off in a photo I still like to do something with photos. Being single makes it challenge so I always have to be a little creative. When I saw this care I knew it was the one. I love that it is bright and cheery. I also love that I could include several pictures to show highlights of my year. I wish I could mail you all a Christmas card but I'd go broke so please take this virtual version and know that I appreciate all of you, near and far, who read my blog! P.S. I love Shutterfly! The cards are great quality and I love the colors in this one. I got them during a great Black Friday sale which was great too! (They look much better in real life. Sorry for the iPhone pics w/ the glare). I love them! Merry Christmas! Your card is hanging proudly on my fridge! Merry Christmas!!! Loved your card! Merry merry! I love this card -- the saying, the design, the bright colours! It's amazing!! !